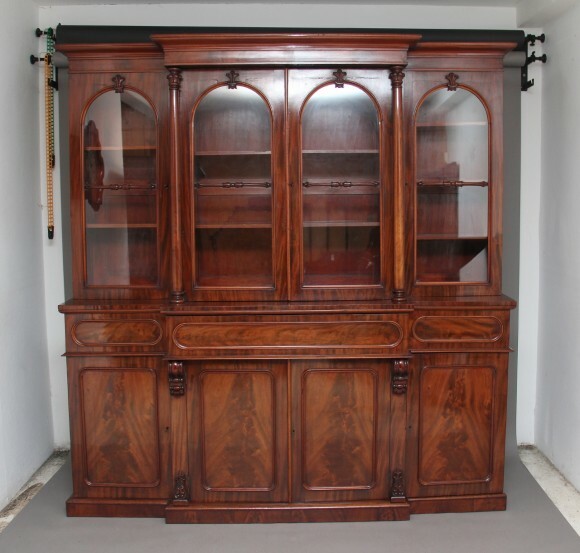 Early 19th Century flame mahogany breakfront bookcase, the moulded cornice above four arched glazed doors, with carved decoration at the top of each door and a turned and carved spindle at the centre, the middle doors flanked either side by decorative turned columns, opening to reveal a selection of adjustable shelves, the bottom section having a frieze drawer at the centre and the frieze having lovely oval shaped panels in each section, with four panel doors below with carved decoration at the centre, standing a plinth base. Lovely quality and a fantastic colour. Circa 1830.